It’s time to look at a Crash manga. I recently got the PS4 collection that came out and it was definitely fun. That being said, the title character actually wasn’t that good. He’s probably one of the worst title characters that you are ever gonna see at least from the iconic ones. That may set off some warning bells for the manga since naturally you will usually want to have a good main character for the story right? This one is a gag manga so to an extent it never had all that much promise. I can see why it was cancelled. So the story starts off with Crash getting dumped as the heroine declares that she is grown up and ready to move on. Crash literally cries himself a winner and goes into depression. Fortunately that’s when Cortex shows up and decides to trick Crash into helping him conquer the world. He tells the lead that if he collects all 25 of the Power Crystals that the heroine will come back to him. Crash eagerly believes this and sets off with his buddy Aku Aku to collect them all. Is Cortex really being honest? It may not matter because Cortex himself doesn’t know what he wants. The plan seems simple enough at face value. He’ll let Crash handle the dangerous work of going into the various mazes to grab the gems while he stays at home. However, Cortex also tries to destroy Crash several times which would wreck this entire plan right? I couldn’t really get what his motivation for such a thing would be. Perhaps he just couldn’t hold back his utter disdain for Crash? He even tries to eat the main character. Also, why bother showing up in person at all? That defeats the purpose of sending Crash in first because then Cortex is subjecting himself to the same level of danger. Not very smart for a supposed genius. Another thing that holds the series back is the amount of filler inside. The heroes only collect 4 gems across 2 whole volumes. At that pace it would take a grand total of 13 volumes to get them all. Have you ever heard of such a long video game adaption? Most of the chapters are stand alone as well so it’s not like the series is using it as an elaborate set up. One chapter is about Crash turning tiny and basically messing with Cortex from the inside. The amount of crude humor here is definitely regrettable. It only got worse in the very next story where Crash gets hit in the head and reverts back to a baby. This one has Pac-Man (and the Ghostly Adventures) level of crude humor within it. If you could take Cortex seriously at all before this, you won’t after this chapter. Same goes for Crash naturally. It’s just a little jarring to see chapters like this which don’t have any bearing on the story whatsoever. I guess maybe this was meant to be a really long running series or something, but there’s no way it could have stayed alive so long with this level of quality. As the issues keep piling on for this manga, the art is another one to add on. It’s just very busy and chaotic throughout. You will have a tough time seeing exactly what is happening on the page. It’s not the worst art I’ve ever seen, but certainly in the bottom half. I don’t think a lot of effort was put into it, but I can’t say that I am surprised either. It’s a gag manga so I’m guessing the art and the plot weren’t very important. All of the effort likely went into the gags so it’s a shame that even those weren’t funny. Crash is accurate to the games though. Perhaps even more extreme though. Here he uses the Power Gems as a tooth and ear pick and really doesn’t care about saving the world at all. He barely even cares about collecting the gems seeing as how he puts it off so much. He wasted months just washing dishes because he was out of money. There’s also an annoying monkey character in one of the chapters who steals all of Aku Aku’s money and trolls Crash the whole time. I don’t sympathize with Crash at all to be honest, but once again this had nothing to really do with the plot. The only good character here would be the professional jewel thief. He is also after the crystals so naturally this leads to him meeting up with Crash. Crash makes a fool out of himself as you would expect, but this treasure hunter takes the high road and decides not to rob Crash. Instead he will get the jewels his way and you have to appreciate the guy’s honor code. It is something that the rest of the cast in Crash seem to lack. Too bad he only appeared once as the guy would have elevated the series. I wonder if the series would have been better if they never mentioned anything about getting the 25 Power Gems. After all, marketing the series more as a random slice of life would have been far more accurate and then the filler chapters would actually make sense. I guess it might be weird for Crash to be adventuring for no reason, but it could just be something superficial like trying to get muscles to impress the heroine. It is what it is though and at least having a mediocre manga is better than not having one at all. 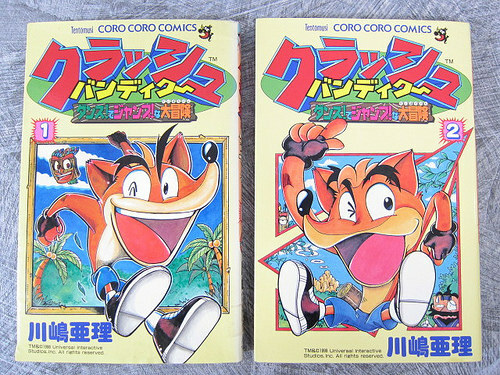 Overall, This Crash manga isn’t very well known and I can see why. I suppose it’s not any worse than the average gag manga, but with some of the others at least I like the characters more. Say what you will about Super Mario Kun, but it is a lot more entertaining just because the cast is able to sell it better. Mario and Luigi have a much better dynamic than Crash and Aku Aku ever will. When we have the big break up chapter between Crash and Aku Aku you can’t help but feel that Aku would be better off without the Bandicoot slowing him down. I guess it’ll be nice for Crash fans if we ever get the lost 3rd volume, but I can’t say that I would miss it. If you’re a big fan of the series then you should check it out. It’s not a terrible series or anything. I wouldn’t recommend it, but the series doesn’t do much wrong aside from just not being funny. At least there is some kind of plot happening even if it takes a break very often. If it ever returns, hopefully it is more focused. This entry was posted in Manga, Manga Reviews, Reviews and tagged Cancelled?, Comedy, Coro Coro Comics, Crash Bandicoot, Gag Manga, Manga, Manga Review, Review by dreager1. Bookmark the permalink.